Matti Friedman gives a fascinating account of the history, and recent partial theft, of one of the oldest and most valuable books in the world. 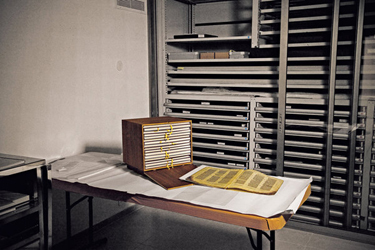 In 1947, in a riot that followed the United Nations vote on the partition of Palestine, the codex disappeared, surfacing 10 years later in mysterious circumstances in the new state of Israel. The codex is currently held in the Israel Museum, in the same building as the Dead Sea Scrolls. It is controlled not by the museum, however, but by a prestigious academic body, the Ben-Zvi Institute, founded by Israel’s second president, Yitzhak Ben-Zvi. Somewhere along the way in the mid-20th century, 200 priceless pages—around 40 percent of the total—went missing. These include the most important pages: the Torah, or Five Books of Moses. The official version of the story, propagated by the academics in Israel who control the manuscript, claimed the pages vanished in Aleppo around the time of the 1947 riot. But we know now that the manuscript was seen whole as late as 1952, five years later. The first description of any significant damage to the codex dates, strikingly, only to 1958—after the manuscript reached the Ben-Zvi Institute in Jerusalem. At around the same time, my investigation found, dozens of valuable books and manuscripts vanished from the library of the same institute. When I approached former officials at the institute with evidence of the other missing books, several went on record saying the man responsible for their disappearance was the institute’s director at the time, Meir Benayahu, a scholar who throughout a long and illustrious career studied, collected, bought, and sold rare Hebrew books. He left his post amid a legal battle over control of the institute in 1970. Benayahu, who died in 2009, came from a powerful political family with roots in Iraq; he was the son of a Sephardic chief rabbi, Yitzhak Nissim, and brother of a senior Likud cabinet minister, Moshe Nissim. (As was common in those years, Benayahu adopted a more modern and Israeli-sounding last name.) This scandal has long been known in Israel’s small and insular academic world but was never made public. Legal proceedings were avoided at the time thanks to the direct intervention of Israel’s president, Zalman Shazar. Police were never summoned, no charges were filed, and no books were returned. Benayahu’s family denies any wrongdoing and says the accusations against him are a smear campaign aimed at covering up thefts by other people; they have asked, rightly, why no one went to the police at the time. Today Benayahu’s family owns a collection of Hebrew texts that is one of the world’s largest in private hands. Whatever precisely happened at the Ben-Zvi Institute, the long-buried affair of the institute’s vanished books—whether it is connected or not to the disappearance of the codex pages—is arguably the worst corruption scandal in the history of the Israeli academy. Andrew looks smug in his Atlantic logo illustration. It’s nice having friends in high places. We used to have a president so rigidly righteous that he actually refused to pardon Lewis Libby for defending his own administration and thus becoming the target of a special prosecutor and winding up convicted of perjury (in a case where no crime was really ever proven to have occurred) by a DC jury. Now we have Barack Obama, who is not like that at all. Intimidate voters, brandishing billy clubs in Philadelphia? You don’t get prosecuted if you were an Obama supporter. Eric Holder’s Justice Department will overrule career prosecutors for you. Are you a governor or state official taking campaign contributions in exchange for contracts? If you’re a democrat, you are OK. Eric Holder’s Justice Department will drop the investigation. Suppose you are a homosexual leftwing blogger, who also happens to be a non-US-citizen, in danger of getting into trouble with immigration if you are convicted of a misdemeanor for smoking marijuana on a Cape Cod Beach? You have a Get Out of Jail Free card, if you are, as Andrew Sullivan is, a faithful defender of Barack Obama and his policies. The US Attorney’s Office will go right on prosecuting non-Obama-supporting-bloggers coming before the court for the identical complaint, but will shock the court by giving you a special pass. Andrew himself is declining to comment on the advice of counsel. John Hinderaker has a comment. Norman Hsu, a bankrupt Hong Kong business, seems to have come to America and set up a shell corporation solely for the purpose of funneling large sums of money to democrat candidates, particularly Hillary. Gosh! Who do you suppose was supplying Mr. Hsu’s corporation with cash? Remember the Johnny Chung campaign contributions of the 1990s? the Archives of Never Yet Melted in the 'Political Corruption' Category.